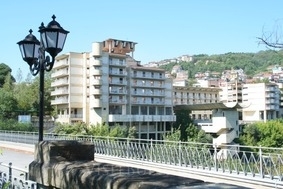 Location: The 4-star Grand Hotel Veliko Tarnovo is situated in the very center of the town and offers a wonderful view over the Yantra River and the OldTown. Accommodation: The hotel offers a total of 35 single rooms, 145 double rooms, and a presidential suite. All rooms are comfortably equipped with private bathroom, satellite TV, and telephone. Dining: Tsarevets Restaurant with seating for up to 220 people, offering Bulgarian and European cuisine.Also available is the a la carte restaurant, Pliska, with seating for up to 100 people. Facilities: Relax and enjoy yourself at the sports center, indoor swimming pool, 2 saunas, solarium, fitness center, and massage center. The hotel also offers shops and a hairdresser as well. Meeting facilities: For meetings or special events, the hotel provides 4 conference halls with seatingfor up to 100 persons.Equipment is available upon request.